I am interested to see what's been developed. I think that the tourism signs, while overkill with the quick succession signs, were ultimately successful. The gateway signs for particular regions are helpful, and work well in conjunction with New York's beautiful themed rest areas (take note, other states). I think that many of the issues have been resolved - such as the display of the website and app. I hope those new signs that were used during the campaign - like New York State Parks, and Path Through History, are not reused - or used outside of those gateway signs. They were unreadable at highway speeds, much less anything slower. Too much text. What's wrong with the park/tree icon and the state park name under it that is/was used? How about one gateway sign, welcome to this region, see what we have at our rest stop in x miles. I wonder if there is any numerical measure for success. I don't know how many people end up in upstate without at least a vague idea of what they are doing and would have their plans changed because of signs. Earlier articles about the negotiation said that the new signs would just be the main ones, not the smaller ones, and not have the URL or app on them. Apparently the big impasse was over whether the word "experience" could be in italics or not. When most people think of famous Whipple's, they think of the local grocer that liked to squeeze toilet paper. Well, there is actually a very famous and influential Whipple that revolutionized bridge building in the 1800s. His name is Squire Whipple and when I lived in Albany I was able to find one of his remaining bowstring trusses. And as I researched for this blog entry, I found out that there are three additional Whipple Bridges in the Albany area. Any comments on the October 10th Schoharie Ford Excursion limousine crash, that killed 20? One has to wonder if driver impairment was to blame here. You may want to try the dedicated thread on the subject. A small question.. There is some road work on I-87 southbound, between exits 10 and 9. Just 1 truck and 1 bulldozer - but it goes on for the second week if not more. It really looks like they are putting in a driveway to the interstate. Might just be some sort of DOT dumping area. They put one in on I-390 just south of exit 10 some years ago. I thought it looked like a driveway, too. Is it directly opposite the U-turn? Just drove on Skyway. Can confirm longitudinal tining and new signage throughout. What road is busier, Transit Rd or Niagara Falls Blvd? Both have segments over 25K, but Transit Road has high volumes sustained for much longer distances, and certainly has more regional importance. NYSDOT region 10 long island is holding a public meeting 11/28 in regards to the oakdale merge on ny-27 sunrise hwy which is a horrible bottle neck in both directions. State is seeking public opinions about issues and possible solutions. There is a short term fix contract already let which is scheduled to begin in the spring including ramp meters, closing some ramps and opening up median barrier to allow emergency vehicles to cross over. I’ve seen some of the long term plans which include stacking the highway as the dot is pretty constrained with donated land for state park and arboretum bordering both sides. Either way, it’s going to cost a fortune and take forever to finish and the public is gonna be pissed either way. I plan on attending just to see what’s happening there as most of us at dot are left in the dark about these things. My input does not reflect those of NYS, NYSDOT, or any other government or non-government agency. Do not take anything I say as truth unless it is released by said agencies. 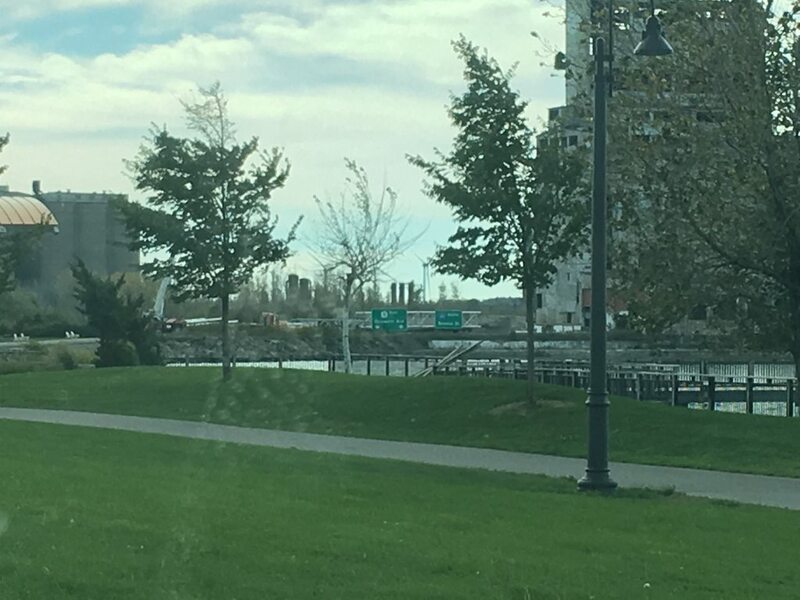 Has there been any discussion about the upcoming reconstruction of the Interstate 278 Promenade structure in Brooklyn? This page has 156 pages and I don't have time to go through all of them. I have a feeling this project will be a long, difficult one. Does anyone have any ideas about this project? I want to say yes, but I don't recall specifically. It would be more likely to be in the NYC Roads thread, though. They haven't settled on what they're doing yet. Still trying to sort through all the community feedback. Are any other highways in New York that currently have sequencial exit numbers planning a mileage-based conversion in the near future? “Is New York State planning to change its Interstate exit numbering system from a sequential system to a distance-based milepost system? At this time, the Department does not have immediate plans to adopt the mileage based exit numbering system although strong consideration has been given to the idea. The use of both consecutive and milepost exit numbering systems is approved by the Federal Highway Administration. While many states have converted to the milepost exit numbering system, New York is one of several states in the Northeast that still numbers freeway exits using the consecutive numbering system. Actually, New York was an early pioneer in converting exit numbers from a consecutive order (e.g. Exit 1, Exit 2, Exit 3, ...) to a system based on distance (miles or kilometers). In the 1970's, New York unsuccessfully experimented with the mileage based system in New York City and Schenectady. The milepost system works best when exits are separated by more than a mile. Unfortunately, in some of New York's urban areas, exit spacing is less than a mile. As others pointed out, it’s dated. As far as I know, here on Long Island there are no plans to change the exit numbers. There’s a few sign jobs but none involve exit numbers from what I saw. This was the case in 2003. However, the 2009 MUTCD mandated it, though FHWA has not set a hard end-date on when all states must conform. At one point, there was a soft date during this current year (2018). Is New York State planning to change its Interstate exit numbering system from a sequential system to a distance-based milepost system? The Department released a report in January 2003 regarding the feasibility of converting exit numbers on freeways from a consecutive numbering system to a milepost exit numbering system. The conclusion was that although the change is technically possible, it would be quite costly and would have to compete with other worthwhile projects for consideration of scarce resources. Since the Federal Highway Administration has not made adopting the reference post marking system a mandate, but rather an option; New York will likely defer the changeover until it becomes a requirement or additional funding is available to implement the plan. Keep in mind that this page hasn't been updated in more than a decade. Since then, I-781 was built with mileage-based numbers, US 15 was converted, the Taconic gained numbers, and the I-84 conversion was designed. Maybe someday, all the highways in New York, Massachusetts, New Hampshire, Delaware, and elsewhere will conform to the 2009 mandate over mileage-based exits. Of course, I realize this will continue to be a long, slow process. I also realize that universal public acceptance of mileage-based exit numbers can never be mandated.